Our lovely Jeff Gibbs was taken ill only a couple of weeks before his infamous end of season cruise. I am so very pleased to say he has been given a clean bill of health and will no doubt be back on board as soon as the weather warms, if not before. Thankfully Vern became champion of the moment and stepped up to the binnacle at the last minute to skipper for the week, and what an amazing week it was. encompassing the hottest September day since days of yore, he also chose good tides which allowed our passage plan to and around The Channel Islands. He didn’t do too badly on the wind though a little more from the South on our way home next time would be appreciated please Jeff. Sunday evening took us down to Portsmouth to get a head start on our passage East around the Isle of Wight. A 0430 start on Monday morning was a little harsh though it allowed us to see the most beautiful sunrise. The wind and tide had us riding the waves around the island until the tide turned and flowed in our direction. Visibility was incredible and we could see the IOW until halfway across the Channel which meant we only had a brief time before sighting France. knowledge as to when to leave the next morning – “on a high tide; no, two hours before a high tide; no, five hours before a high tide; actually in a sail boat I have no idea as I have a motorboat” – was seconded only by the experience of the ‘fairground’ mirrors in the shower block which gives this port a worthwhile visiting attraction. I am surprised that it is not mentioned in The Channel Pilot! Tuesday morning heralded an exciting day. We were all looking forward to our sail to St Peter Port, Guernsey. We timed our departure perfectly and left with clear visibility and a dramatic scene of white waves crashing onto the grey rocks beyond the harbour entrance to our starboard. I looked out for Poldark galloping across the hills however his absence was the only disappointment of my day. Adding to our dramatic backdrop were ominous black clouds building behind the island accompanied by deep rumbles of thunder and flashes of forked lightening to the South and West. This caused me some concerned as I hadn’t experienced this in the sunny Solent and I questioned my crew mates on the likelihood of the tall metal pole in the centre of the boat being struck. I was reassured by several theories of the lightening earthing in the sea (possibly under my feet as I was at helm) and electrics being burnt out which sent me hastily down to the chart table to regularly plot our position. Despite this drama we headed out into the sunshine while we watched the majority of the storm pass behind us. Next on our agenda was the experience of the thrilling Alderney race which for some of us on board was a first. The race didn’t fail to disappoint as even on a neap our speed shot up which meant we caught up with the tail end of the storm and had a five minute hail stone storm which soaked everyone except for the Skipper and First Mate who were very concerned about keeping an eye on the charts until the sun appeared again. We had a wonderful sail to Guernsey with so much to see, experience and navigate, arriving at lunchtime to refuel, berth and explore the town on a very sunny and warm afternoon. At this point I am going to mention, far too late, our wonderful chef for the entire journey – David Smithson – he fed us heartily, morning, noon and evening and after looking around the quaint streets, the fort and the natural swimming pools David once again supplied a delicious supper with of course a little fluid to wash it all down. was turned ‘on’ more than ‘off’, this ended near midnight when the wind picked up to a force we were glad not to be sailing in and the rain came down. We were happy to be cosy in our bunks watching the show, though Tony at one point did climb through the main hatch to check the dingy was still tied to the boat. We had previously pumped this up in preparation for our sail to Sark the following day. and dropped anchor in the cove. The fun then began as Tony and Vern did the rowing relays between boat and shore. I was volunteered in the dingy first with David H and David S following close behind. We walked up the hill to the memorial for a team photo before Vern took us on a tour of the island. I was up for hitching a ride on one of the horse and carts that passed us however the local drivers were navigational hazards. We walked across La Coupée, the causeway which joins Sark and Little Sark, this is currently a narrow concrete road, built in 1945 by German prisoners of war under the direction of the Royal Engineers. Vern then changed direction to the only other landmark he knew on the island – the pub – we had lunch and found delicious ice creams for our hot mooch back to the bay. Back on board for a high, slack tide we were able to navigate through the very narrow Gouliot Passage which separates Sark from Brecqhou and caused sharp intakes of breath from the crew. 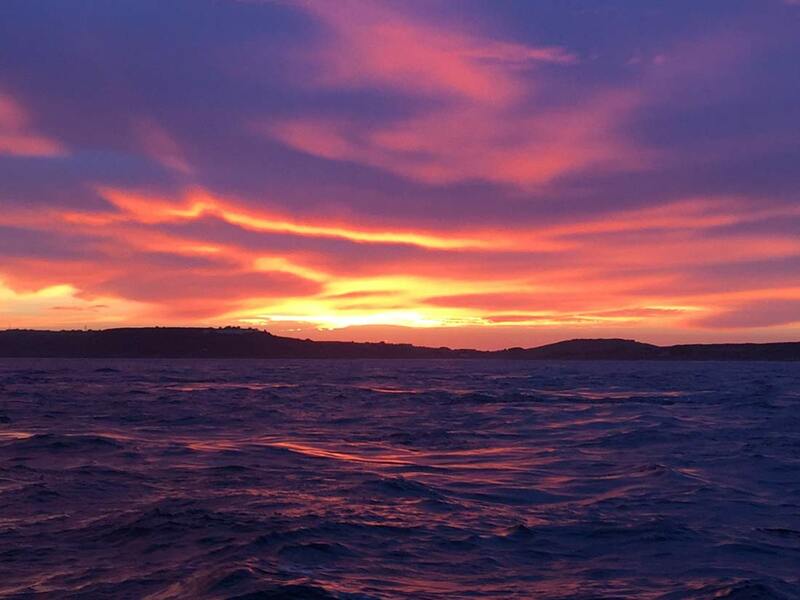 A fabulous day ending in a sail back to Alderney for the night where the sunset was the most beautiful I have ever seen, each minute the colours changed and the picture shown does it no justice at all. Thursday was our sail back to the Solent, the wind had forgotten what to do, the sun beat down on us and the sea was a flat mirror with the only relief from the heat being down below in our cabins. Shirts came off and I spotted a few dolphin fins giving us a very Mediterranean journey back to Lymington. Peace was only interrupted by me opening yet another packet of cheese straws, ginger biscuits or mini cheddars. We spent hours trying to spot ships on the horizon for entertainment. a pleasant sail back to Universal. Where we all thanked Vern heartily for stepping in at the last minute, his tuition during the week, and his endless energy and wit. 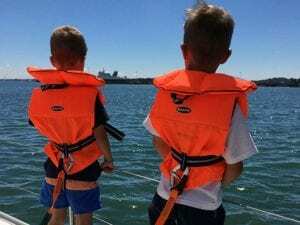 I highly recommend sailing with him – he’s alright!